operation and maintenance of the completed facility. Engineers, scientists, and financial analysts must utilize principles from a wide range of disciplines: engineering, chemistry, microbiology, geology, architecture, and economics to carry out the responsibilities of designing a wastewater treatment plant. 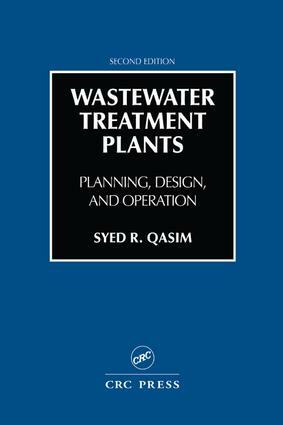 The objective of this book is to present the technical and nontechnical issues that are most commonly addressed in the planning and design reports for wastewater treatment facilities prepared by practicing engineers. Topics discussed include facility planning, process description, process selection logic, mass balance calculations, design calculations, and concepts for equipment sizing. Theory, design, operation and maintenance, trouble shooting, equipment selection and specifications are integrated for each treatment process. Thus delineation of such information for use by students and practicing engineers is the main purpose of this book.